We’re a full service marketing and advertising agency, so lately here at Ridge we've been doing some exciting website video production for a variety of clients in B2B and consumer. Though most are less than 90 seconds long, there’s many hours of behind-the-scenes work that goes into each one. Storyboarding is one of the most important parts of the process. It is a graphic representation of how your video will unfold, shot by shot. It sets the tone and pace for the entire project. Here’s a peek into the work we did to bring a recent video to life. As always, our writers drafted a complete script before we moved into the storyboarding stage. Working directly in Photoshop, we began laying out the key scenes of the video and thinking about the transitions between each. This allowed us to see that for the timing of the scene changes to make sense, the script would have to be adjusted in places. 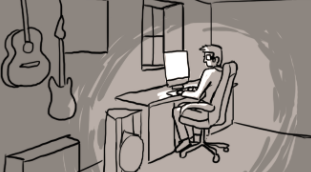 Realizations like this are why storyboarding is important; visualizing the flow of the video second by second allows potential issues to be caught early, rather than at the live shoot. As the first draft of the storyboard was approved, location scouting was also being wrapped up. 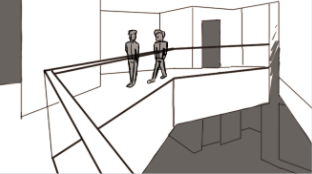 In most cases, having the location picked out before starting the storyboard is ideal, since the limitations of the physical set can influence the decisions made in storyboarding. In this case though, the timing worked out perfectly. During the visit to the location, our director referenced the storyboard to take pictures of the set from the angles that would be used during shooting. Back in the studio, we used those pictures to further refine the pacing of the video by placing the sketched actors in the real environment that they would be filmed in. At this point, the script and storyboard were approved and it was time to film. The work spent refining the storyboard paid off: the actors used it as a reference for positioning and timing during the shoot, and the director and crew used it to keep true to the original vision of the client. This allowed the shoot to go smoothly, making for an awesome final product. Check out the final video below, and see if you can spot the locations and scenes we planned on paper before we shot a single frame. Stay tuned. We’ll be sharing our storyboarding process with a B2C client of ours in an upcoming blog post.